Major scales are the most important piano scales: firstly, because they are very common and, secondly, because they are fundamental to understand keys. If you hear someone mention that a piano sonata by the composer and pianist Franz Schubert is played in A Major, it means that it depends on the A Scale. You can scroll down and see illustrations of all Major scales, further down you will see an overview with all the notes and the intervals, semi-tones, and finally the formula of the Major Scale. This theory helps you learn the concepts and memorizing it easier. See also Major scales exercises and arpeggios. Another important thing to know about is the intervals and steps. These are always the same regarding scales in a specific category. This is something that helps you a lot until you have memorized all the scales and also the opposite way: you don’t need to memorized them if you know the intervals. The nature of the intervals labels the Major Scale to a diatonic scale. Some of the scales have two names divided by a slash (e.g. C# and Db), because they can be played in two different keys. The notes are, however, the same on the keyboard. As an example, C#, D#, F, F#, G#, A#, B#, C# and Db, Eb, F, Gb, Ab, Bb, C, Db (as in C# / Db scales) are the same notes but partly written differently. In some cases, there are double-sharps (e.g. F##) that could look peculiar, see theory for an explanation. Also, the notes in the diagrams and the written out notes in overview sometimes differ. This is because the notes below the diagrams are foremost thought to be easy to understand. An easy way to start improvising on the piano is to play major scales together with the chords that use the same notes. To explain further: you can for example play chords like C, Em, F, G together with the C Major Scale. Preferable is to you play the chords with your left hand and notes from the scale with your right (more on improvisation). An interesting thing is that different major scales have their own “sounds”. For example, C is suitable for ballads and Eb can sound a bit like Bach. 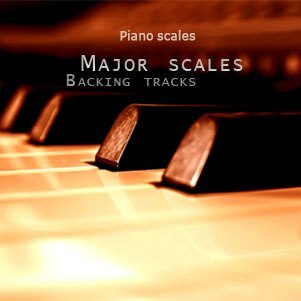 Backing tracks for major scales presented by Pianoscales.org. You can play piano to these tracks by using the Major scales. All tracks are available for members. Become a member.